The Discipleship Square can help you understand what it’s like when you come into an MC (aka missional community, micro church). You come in and everything is new and (if things are healthy) you feel well directed, led, and included. You get to watch what’s going on, participate some, and really just enjoy yourself. That can be a lot of fun for a little while. But it’s important to remember that as a community, we are trying to imitate very intentionally the lifestyle of Jesus. We want people to know they are welcome, important to us, and included (invitation), but we also work to get people engaged in mission and discipleship in ways that lead to spiritual growth (challenge). We give attention to all three dimensions we see in Jesus’ life – Up, In, and Out. Most people are good at one or two of those dimensions – and maybe not so good at the other. As you get more involved, it’s pretty common to feel challenged and stretched, especially in that not-so-good-at-it dimension. You may feel out of your comfort zone and uncomfortable. It’s tempting at the point to try to go back to the easy “observer” phase or even to drop out. The discipleship square helps us all anticipate that and work together to push through it. It also points to the time when you will be more comfortable and competent in all three dimensions. When Jesus called his disciples, he began training them systematically and intentionally over time to do the sorts of things, Up, In, and Out, that he was doing. He taught them, showed them, sent them, and celebrated with them. This pattern of growth shows up in all of the accounts of Jesus and we see it in the early church as well. (For that matter, many professions follow a very similar pattern to bring people along to learn skills). Mike Breen and the people with 3dm articulate this very clearly in the “Discipleship Square.” You can read about it in depth in Building a Discipling Culture, available on Amazon or through 3dm. All of us at FCMC recognize that the discipleship square is a logical, helpful way to track how we are growing as disciples and as a communities. 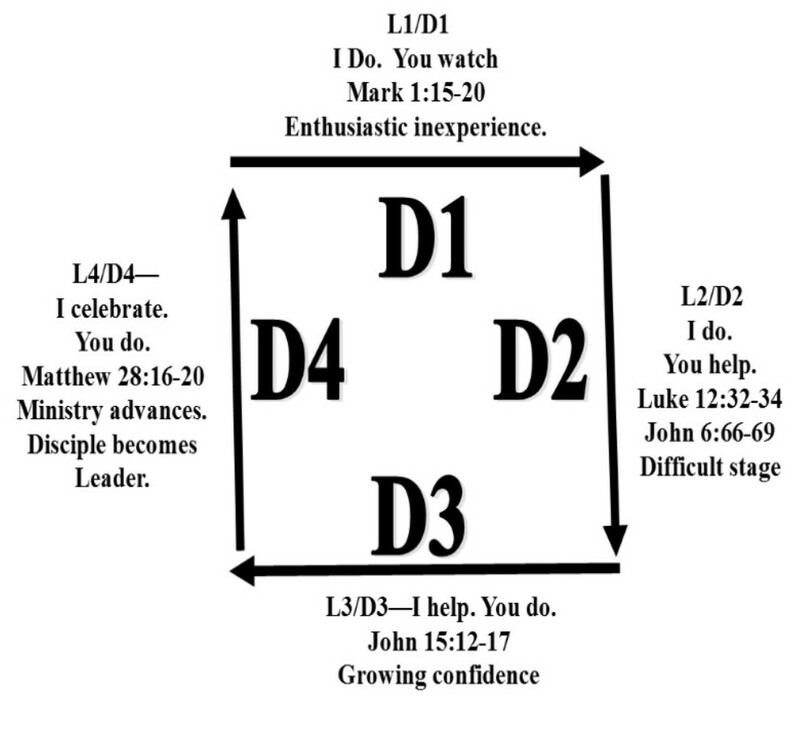 As you look at the illustration, L stands for “leader” and D stands for “disciple”. It is tempting, especially for leaders, to take shortcuts. D2, for example, is pretty difficult. The leader needs to invest extra time with the disciple during that phase. But as we work through the square, we can anticipate taking on new and challenging things. Along every leg, the discipleship square helps our leaders to understand better how to lead and encourage, and it helps the disciple to anticipate how things unfold. For example, the leader gives more time leading by example for the disciple in the difficult D2 stage but shifts to more of an encouraging role as confidence and competence grow for the disciple in the D3 stage. We recognize that not everyone has much ambition to be a leader, but all of us are commissioned by Jesus to make disciples. All of us are expected to help someone else become a disciple. That requires developing some skills for leadership. Jesus’ first disciples were not prepared to lead when they met him, but were equipped to change the world by the time he was done. Our vision is to be a part of that same movement of discipleship and mission, allowing God to work through us to impact and change the world today—one heart at a time. And that will require all of us helping one another grow as disciples. Of course, we can’t make that happen. Spiritual growth is something God brings about. But the square helps us understand the way Jesus made disciples. It gives insight regarding what participating with God looks like. That way we can encourage one another on the journey. This entry was posted in Discipleship, Missional Community Experience, vision. Bookmark the permalink.